This is a NON SMOKING unit. A $300.00 fee will be assessed for non-compliance. CHECK IN – You will receive a check in instructions email 2 days prior to your check in. In this check in email, you will be provided with a code for the coded deadbolt on the front door, driving directions, the address, and information about the home. CHECK OUT PROCEDURES – There will be no late check-out without prior authorization. A $50.00 per hour fee will be charged to guests who are not authorized for a late check out. Upon check out, the home will be left locked, all debris, rubbish and discards are placed in refuse containers inside and outside. There will be a $100 fee for guests who leave trash in the homes/garage or do not set the garbage bin by the road on the trash collection day. MAXIMUM OCCUPANCY - Each property has a specific maximum occupancy. Please take note of the maximum number of guests allowed in the homes before making your reservation. This policy is strictly enforced and you will be charged $20.00 per person per night if you are over the limit or asked to leave if you have exceeding the maximum occupancy. Most units have a private septic and well system, which can only handle the number of occupants, stated thus we will ask you to leave. Guests must be at least 21 years of age to rent units. No RV’s allowed unless prior approval has been granted in writing. PETS - No pets are allowed unless the listing specifically states it is a pet friendly rental. In the event it is a pet friendly rental, a $10 per day per pet non refundable pet fee applies. No more than 2 dogs are allowed. Pet owners are responsible for cleaning up of any/all pet refuse. Pets are not allowed on furniture at any time. Any evidence of pets on furniture will incur an extra cleaning fee of $100.00. All pets must be up-to-date on rabies vaccinations and all other vaccinations. All items above are the sole responsibility of the pet owner. The home owners/property manager assumes no responsibility for illness or injury that humans or pets may incur while on the premises. A $200.00 fine and a $20.00 per day per pet fee, will apply if a pet is found on the premises without prior approval. LAKES/WILDLIFE – Please do not disturb the wildlife or geology on the property. No shooting firearms, no hunting and no rock collecting on the property. Please use trail system when ATVing and be considerate of the property. No off-roading. Small children should be accompanied by an adult when walking the property. RESERVATION DEPOSIT – An advance payment equal to 50% of the total reservation is required at the time of reservation. The advance payment will be applied toward the room rent. Reservations made through Airbnb are subject to the payment terms of Airbnb. We will automatically charge the card we have on file for you 14 days prior to your reservation. Please make payments via credit card or personal checks payable to Rushmore Vacation Rentals LLC. Reservations paid by check, cash or money order will be required to provide a valid credit card for incidental purposes. The advance payment is not a damage deposit. The TOTAL BALANCE is due fourteen (14) days before your arrival date. Fees: A fee of $35.00 will be charged for all returned checks. DAMAGES – As the guest, you understand you are responsible for any damages or theft. You will be charged accordingly for any damages or theft which occurred while you were on the property. No caving clothes are allowed in the house or washing machine. Manganese Dioxide is a black greasy material found in the caves near our area, which is highly staining. Damage insurance and vacation rental insurance can be purchased from CSA along with your reservation with Rushmore Vacation Rentals if you completed your reservation with Rushmore Vacation Rentals. If you made your reservation through VRBO/Homeaway/Airbnb/Flipkey/Tripadvisor, please purchase any insurance through their web sites. Vacation Rental Damage Protection: As a part of your stay, you may purchase a Vacation Rental Damage Protection plan designed to cover unintentional damages to the rental unit interior that occur during your stay provided they are disclosed to management prior to check-out. If purchased, the policy will pay a maximum benefit of $3,000. Any damages that exceed $3,000 or are not covered under the plan will be charged to the credit card on file. If, during your stay at one of our rental properties, an insured person causes any damage to real or personal property of the unit as a result of inadvertent acts or omissions, the Insurer will reimburse the Insured for the cost of repair or replacement of such property up to a maximum benefit of $3,000. Certain terms and conditions apply. Full details of the Vacation Rental Damage coverage are contained in the Description of Coverage or Insurance Policy www.vacationrentalinsurance.com/g20vrd . The Vacation Rental Damage plan can be purchased up to, and including at, check-in. By submitting payment for this plan, you authorize and request CSA Travel Protection and Insurance Services to pay directly Rushmore Vacation Rentals, any amount payable under the terms and conditions of the Vacation Rental Damage. Please contact Rushmore Vacation Rentals directly if you do not wish to participate in this assignment. VACATION RENTAL INSURANCE-CSA Vacation Rental Insurance has been made available with your reservation. Vacation Rental Insurance reimburses for pre-paid, non-refundable expenses due to certain unforeseeable circumstances that may jeopardize your vacation investment and force you to incur unplanned expenses. We strongly recommend you purchase this valuable protection. If not purchased, you acknowledge you have read and understand our cancellation policy and choose not to purchase Vacation Rental Insurance on behalf of all occupants. Separate terms and conditions apply, read your policy carefully and contact CSA at (866) 999-4018 with coverage questions. Rushmore Vacation Rentals strongly recommends you consider travel insurance to protect against potential losses. MAKING ADDITIONAL CHARGES TO TV SERVICE - As the guest, you understand you are responsible for any extra charges made to TV service while staying at this home and will be charged accordingly. REMAINING BALANCE - The total balance remaining is due fourteen (14) days before your arrival date. If Rushmore Vacation Rentals is not contacted in regards to final payment, the remaining balance will automatically be charged to the credit card on account. Payment may be made in the form of credit card, bank money orders, cashier’s checks or personal checks payable to Rushmore Vacation Rentals LLC. Reservations made through Airbnb are subject to the payment terms of Airbnb. Cancellation on or after 14 days prior to arrival will result in the forfeiture of the entire rental amount. Early/late departure does not warrant any refund of rent or deposit. ILLEGAL SUBSTANCES – The use of illegal substances/drugs/narcotics are not allowed on site and guests will be evicted immediately. Tennant will also be liable to pay for any damages or destruction resulting from illegal substances. NO DAILY HOUSEKEEPING SERVICE – Rates include a one-time cleaning fee. While linens and bath towels are included in the unit, daily maid service is not included in the rental rate and is not offered. We do not permit bath towels or linens to be taken from the units, and we provide extra spa towels for your use. Bed linens are only provided for the number of guests indicated on the reservation. All cleaning fees are non-refundable. NO SUBLETTING – Tenant will not sublet any part of the premises or assign this agreement without the prior written consent of Rushmore Vacation Rentals LLC. GARBAGE REMOVAL – Please follow the instructions found in the property binder/checkout instructions on site at the rental. Failure to abide by the garbage removal policy can result in a fine as noted in the binder. There will be a $100 fee for guests who leave trash in the homes/garage or do not set the garbage bin by the road on the trash collection day. MAINTENANCE ISSUES - Maintenance problems in the home will be handled in a timely and professional manner. The rental rate will not be adjusted due to any malfunction of equipment, which includes but is not limited to TV’s, VCR’s, DVD players, air conditioning units, hot water heaters, stoves, refrigerators, door locks, and hot tubs. 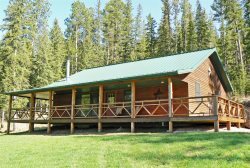 FIRES – Guests understand that the rental is located in the Black Hills National Forest Protection District. Fireworks and bonfires are prohibited. You will be held responsible for any and all damages. Only rentals that are advertised as having fire pits are permitted and they must be used in accordance with the fire burning permit laws found in the property binder on site. Please contact us before burning to ensure it is a safe but also allowable time to burn. Not abiding by these restrictions could result in a fine, which you will be responsible for. HOT TUB/SPA USE – If the home has a hot tub please remember there is a certain health risk associated with this facility. Use at your own risk. Our housekeepers sanitize, refill and replenish chemicals in the tub prior to your arrival. DO NOT STAND ON THE HOT TUB COVERS. Hot tub covers are for insulation purposes and are not designed to support a person or persons. They will break, and you may be charged for replacement. Remember when not using the hot tub, leave cover on so hot tub will stay warm. Food and drinks are NOT ALLOWED in the hot tubs and children under the age of 16 are not permitted to use the hot tub. Misuse of the hot tubs may result in a charge of $50.00 per each occurrence. FIREPLACE/WOODSTOVE – Woodstoves are a vented wood/log firebox. Please do not throw any paper or other combustible materials in the fireplace. Woodstoves that are not permitted for guests use will have a sigh that states they are not allowed for guests on the stove. Gas fireplaces are permitted unless otherwise noted in the rental. WATER AND SEPTIC – Some of our cabins/homes are on a well and septic system. The septic system is very effective; however, it will clog up if improper materials are flushed. DO NOT FLUSH anything other than toilet paper. No feminine products should be flushed at any time. If it is found that feminine products have been flushed and clog the septic system, you could be charged damages of up to two hundred dollars ($200). STORM POLICY/ROAD CONDITIONS – No refunds will be given for storms, but reservations may be rescheduled. Mountain roads can be curvy and steep. Gravel drives are well maintained, however we highly recommend four wheel drive and/or chains during the snow months. We do not refund due to road conditions. PARKING – Vehicles are to be parked in designated parking areas only. Parking on the road is not permitted at certain homes so please pay attention to notices and signs available at the home. Any illegally parked cars are subject to towing; applicable fines/towing fees and is the sole responsibility of the vehicle owner. LEFT AND/OR STOLEN ITEMS – Rushmore Vacation Rentals is not responsible for any personal item(s) left in the home or any personal item(s) that are stolen during tenants stay. If Rushmore Vacation Rentals is able to recover any personal items left in the home, the tenant may choose to have Rushmore Vacation Rentals ship the item(s) to the tenant at the tenant’s expense. Payment must be received before Rushmore Vacation Rentals will ship the item(s). This home is privately owned; the owners are not responsible for any accidents, injuries or illness that occurs while on the premises or its facilities. The Homeowners are not responsible for the loss of personal belongings or valuables of the guest. By accepting this reservation, it is agreed that all guests are expressly assuming the risk of any harm arising from their use of the premises or others whom they invite to use the premise. The agent may enter the premises at any time in the event of emergency, but will use its best efforts to give 24-hour notice for normal maintenance or sales inspections. Rushmore Vacation Rentals is a single agent and works on behalf of the homeowner and owes duties to the homeowner, which includes good faith, loyalty, and fidelity. Rushmore Vacation Rentals will negotiate on behalf of and act as an advocate for the homeowner. Should the owner of any property elect to remove their property from our rental program, the guest shall not hold Rushmore Vacation Rentals liable. In such an instance, the guest will be relocated to comparable accommodations determined by the rental agency. If comparable accommodations are not available, the guest will receive a full refund or if the guest chooses to cancel, they will receive a full refund.